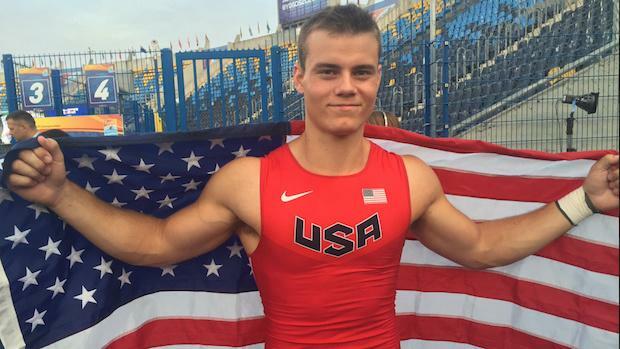 Team USA earned four more medals today: gold in the junior men's pole vault, thanks to a huge breakthrough by Deakin Volz; silver in the junior men's 400m hurdles, thanks to a blistering finish by Taylor McLaughlin; and two matching gold medals in the junior men's and women's 4x100m relays. Tia Jones and Alexis Duncan looked strong in the 100m hurdle semi-finals, as Jones won her heat in 13.09 (-0.1) and Duncan placed second in her heat with a new PB of 13.02 (+0.6). Two other athletes broke 13 seconds today: Oluwatobiloba Amusan of Nigeria, who competes in the NCAA for UTEP, and Elvira Herman of Belarus, who clocked the day's fastest time of 12.97. Bria Matthews of Georgia Tech, who was fifth in the long jump yesterday, placed fourth in the triple jump this morning. Her top mark of 13.49m was same as the bronze medal-winning mark by Georgiana-luliana Anitei of Romania. Deakin Volz entered the pole vault competition seeded No. 6, but the rising sophomore at Virginia Tech improved his PB from 5.47m/17-11.5 to 5.65m/18-6.5 to take down the Olympics-bound Australian Kurtis Marschall and secure gold. His prior best dated back to the indoor season of his senior year in high school. Taylor McLaughlin improved his PB from 49.73 to 49.45 to win silver in the 400m hurdles, behind only defending junior world champion Jaheel Hyde of Jamaica. 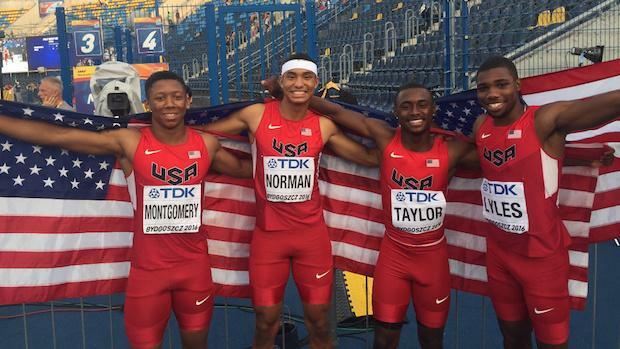 Team USA swept the 4x100m relays with world-leading marks: Michael Norman, Brandon Taylor, Hakim Montgomery and the newly minted adidas pro Noah Lyles turned in a time of 38.93 to sneak by Japan (39.01), while Tia Jones, Kaylor Harris, Taylor Bennett and Candace Hill clocked 43.69 to win convincingly over France (44.05). 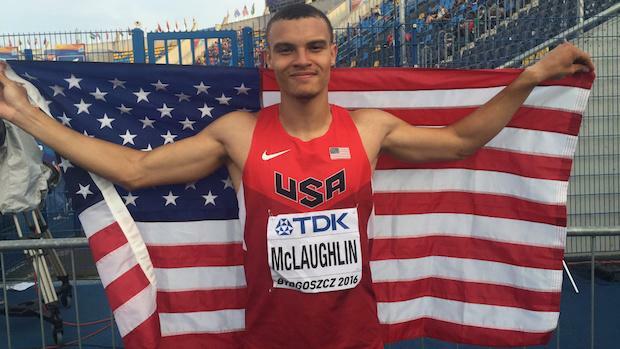 Even in winning the USATF Junior Nationals title in Clovis, Calif. four weeks ago, Taylor McLaughlin complained of fatigue after a long collegiate season that saw him earn All-American honors in the 400m hurdles for the University of Michigan. Since then, he advanced to the semi-finals at the U.S. Olympic Team Trials and competed through all the rounds here in Bydgoszcz, Poland. However, that fatigue gave way to adrenaline on Saturday night. McLaughlin calmly lined up next to Jamaica's Jaheel Hyde, the defending world junior champion, and followed him as best he could through halfway. As the athletes hit the homestretch, Hyde was clearly in the lead and McLaughlin looked to be moving backwards as Kyron McMaster of the British Virgin Islands and Mikael de Jesús of Brazil surpassed him. But with the final 60m remaining, McLaughlin found his fire and fought through the line to win silver in a new personal best time of 49.45. Hyde won gold in 49.03, while McMaster took bronze in 49.56 -- a new national junior record for the British Virgin Islands. "Do your thing. Do what we do." 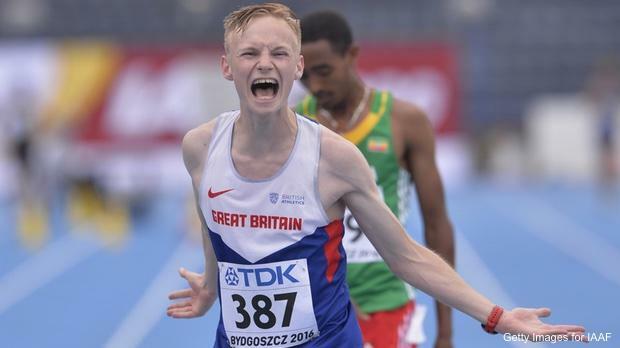 Callum Wilkinson of Great Britain celebrates winning a gold medal in men's 10 000 metres race walk in 40:41.62.